Everyone tells you motherhood will change your life. Of course they are right, but until it actually happens, you can’t truly imagine how motherhood changes everything about your life down to the core of your being. The reality of motherhood can often be more challenging than expected, as it involves life-changing adjustments mentally, emotionally, and physically. 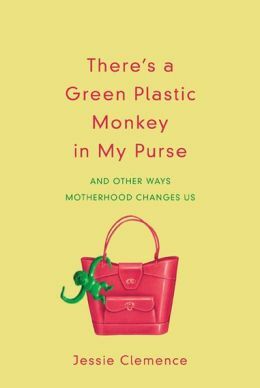 In Jessie Clemence’s book, There’s a Green Monkey in My Purse, readers can find hope and encouragement for the journey. Creatively written in a casual voice and with engaging humor, it explores the traits and skills of a mother from God’s perspective, shares the author’s personal experiences as a mother of two, and encourages readers to draw closer to God. Readers can discover how to display humility, patience, and love not only in parenting, but also in every other area of their lives. At first, I was worried the discussions of God would bother me. I don’t want to discuss my religious beliefs here, but I typically do not enjoy having others tell me what to believe. All the believers were one in heart and mind. No one claimed that any possession was his own, but they shared everything they had…There were no needy persons among them. For from time to time those who owned lands or houses sold them, brought the money from the sales and put it at the apostles’ feet, and it was distributed to anyone as he had need. I wish our culture embraced such ideals in practice, but unfortunately, we don’t live in that society. Clemence goes on to discuss priorities in financial spending, and briefly mentions the dilemma many parents face of their kids wanting more, or wanting what their friends have, such as a new ipod. I’m not sure her discussion of money and “In God We Trust” helps much with this dilemma. Honestly, this book is not for everyone. You definitely need to be Christian and enjoy reading about someone else telling you or interpreting this relationship with God in your life. It’s not for me (and that doesn’t make me an atheist or anti-Christian).